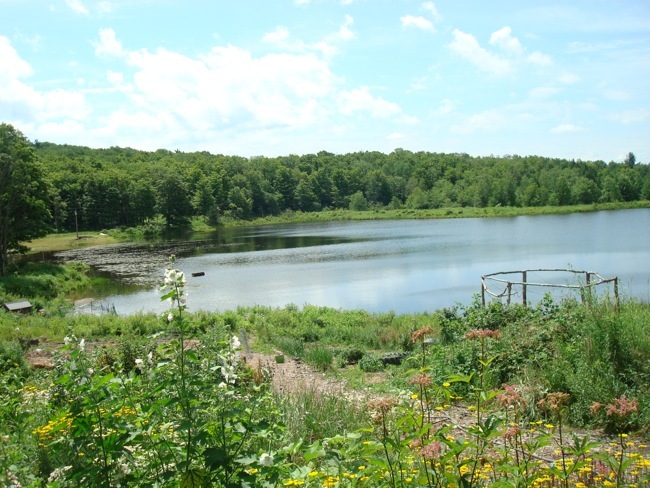 The view across the lake at Lady Liberty Farm / Garden at Thunder Hill retreat center. The lake is stocked with Japanese koi to control algae and sterile triploid grass carp to control weeds. Last week, we had the pleasure of working at Lady Liberty Farm in upstate New York. It’s a gorgeous property spanning 120 acres and the main house sits above a picture perfect lake. Much like the retreat center that JC and I envision, the farm is a central part of the Garden at Thunder Hill Retreat Center. Rachel Ginther and her husband Brian Premerlani are the driving force behind the farm-retreat center and are well on their way to self-sufficiency. They raise a variety of animals – honey bees, dairy goats, American chinchilla rabbits, and heritage pigs, chickens, ducks and quail – as well as broad range of heirloom vegetables, herbs and medicinal flowers and herbs as Rachel is a deeply experienced healer and producer of flower essences and healing products. There are so many stories to tell about our short week at Lady Liberty – I’m sure you will see more than a few posts about it! I was deeply impressed by how many ingenious permaculture techniques are being practiced there (strawberry pyramids, no-till gardening, fallen log planters, solar dehydrator, etc!). We had the opportunity to help expand the farm’s set of potato towers. 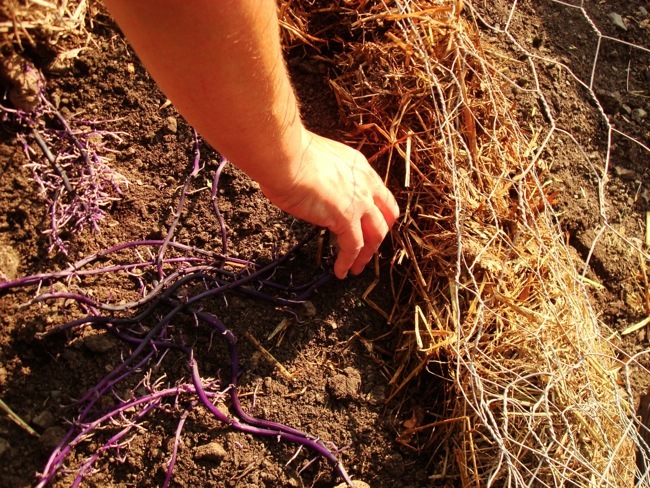 It’s is a simple, space, time and back saving method for growing potatoes that also increases yields – 15-20 lbs of potatoes for each pound planted. Potato towers, erected weeks earlier are filling with hay while the green leaves of the plants growing inside peek out the sides. French intern, Anna, and lead farm dog, Xandra, prepare to spread composted manure around the towers where companion plants will be sown. At Lady Liberty, they try to practice mainly no-till gardening which allows the natural process of the earth, microbes, organic matter and bugs to improve soil fertility without disturbing its structure. (Look for a post on this soon!) 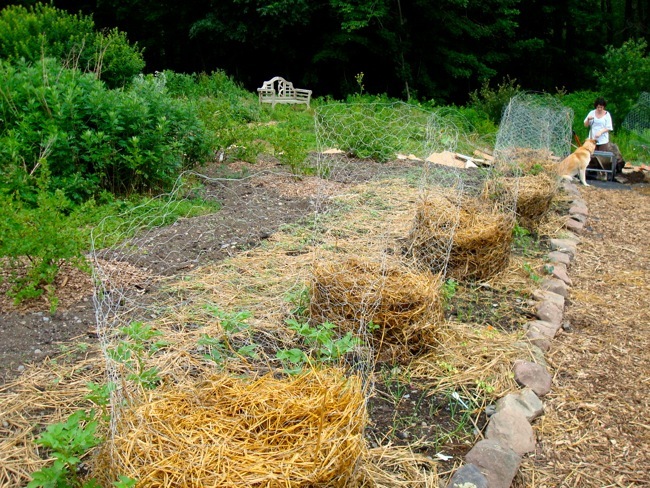 They use cardboard as an initial mulch layer to squash out the existing weeds. 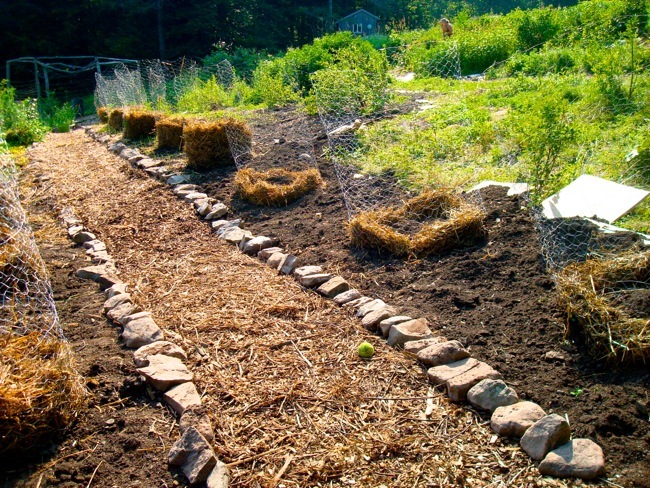 On top of that, they use partially composted hay and rich soil made of decomposed manure. If you are going to create one of these potato towers, there’s no need to prepare the soil this way. Just make sure that your site is free from weeds and has excellent drainage. 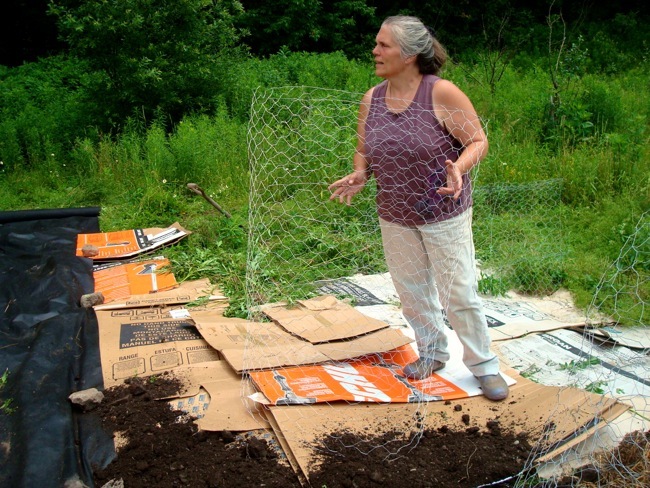 Rachel holds an chicken wire cylinder that will shortly become a potato tower. She is standing upon cardboard that we spread on top of the weeds to extend the garden bed without tilling. Inside the cylinder is a “nest” of hay filled in with rich, composted manure. We put the tower frame on the prepared site and then made a layer of hay with a depression in the center, almost like a little nest. In the center of the nest goes some rich soil. Our soil layers were about 1-2 inches, but just do what feels right. You want to give the roots a good foundation, but they don’t need that much soil. 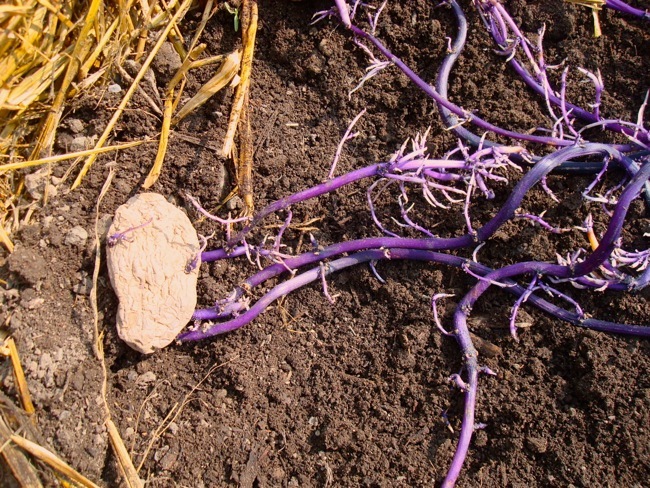 Purple heirloom seed potatoes are being planted in the base of a new tower. Rachel had ordered gorgeous red and purple heirloom seed potatoes from the Peaceful Valley catalogue, but you can make your own seed potatoes. (See below.) We placed about 1 lb of potatoes into each tower with the sprouts pointed inward. This is important. If you plant with the sprouts pointed outward, you will get a smaller yield because the sprouts will have less room to expand in the dark. 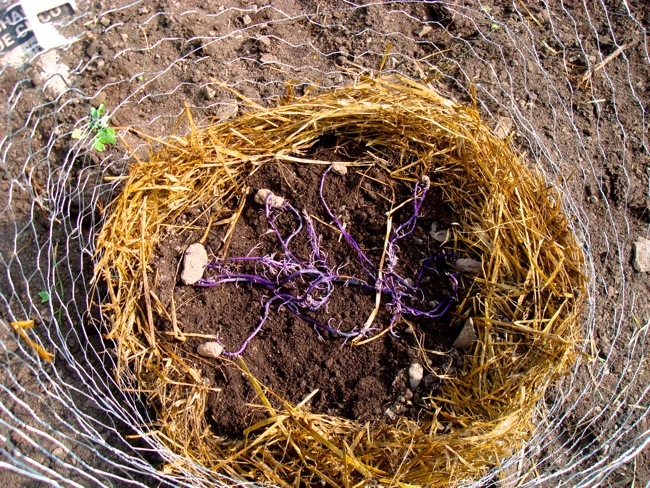 Then we covered the potatoes with a layer of hay ensuring that no light would reach the potatoes. And, as with all new plantings, we watered each set. Eventually, you will see green leaves poking out from the hay both on top and on the sides. 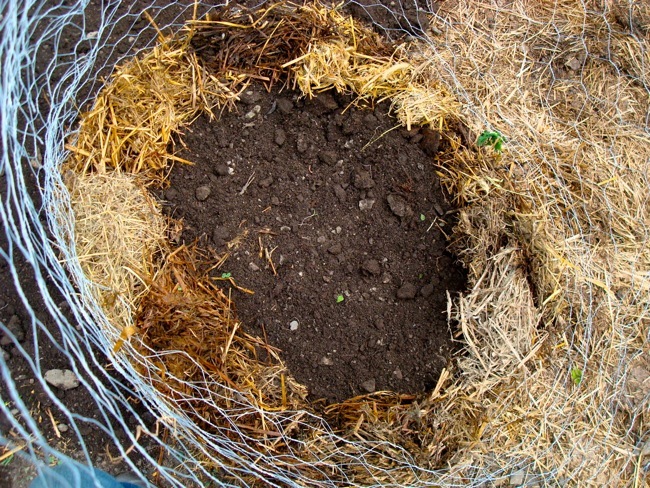 For the leaves on top, each time you see green, add another little layer of hay or mulch material to block out the light. The ones on the sides can just do their thing. Make sure to water the top of the towers regularly. Look for the little flowers. When you see these it means a potato is growing! At the end of the growing season, the green leaves will die back. The length of the season depends on the variety of potatoes and your environment, but I think most potatoes are ready to harvest in the fall. When you are ready, just pick up the tower and dump out all of your potatoes. The mulch can be reused in your garden and the towers can be laid flat until next year. The new towers in the foreground are differentiated from the older towers by the level of hay. As the season progresses, the level of hay will build as you cover each new set of leaves that emerge from the top. Black garden fabric covered with wood chips and weighted down by stones from the garden creates a clean, natural pathway. 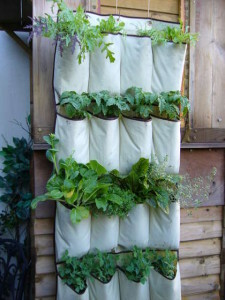 I think this could be a great way for you to grow your own potatoes! You’ll need to find a solution for water drainage out of the bottom, but everything else is vertical! You’ll need a decent amount of light for these, so try to locate on a patio or balcony or in a very sunny window. You can size these however you want, just remember that each seed potatoes needs room to send out roots and the smaller the amount of room, the fewer potatoes you will get from each seed potato. 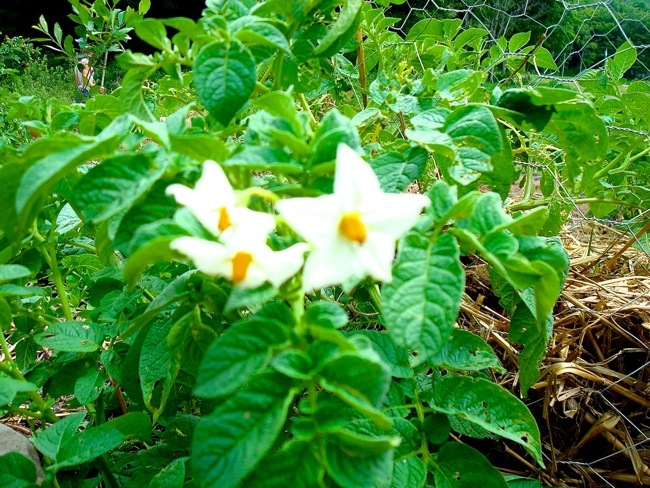 Ever taste an heirloom or farmers market potato and wish you could grow them at home? Well you totally can! Just set aside a few of the potatoes you want to propagate. Store them in a dark, dry place. Soon, you will see sprouts starting to emerge from the eyes. These sprouts will continue to grow, reaching for nutrients and water as long as they are kept in the dark. When the sprouts are more than an inch or so long, go ahead and plant them. If you have any questions about this method, please post them here in the comments section. I will get answers from Rachel if I can and post them here so that everyone who’s interested can see the answers. We had such a good time planting potatoes and doing so many projects with you on the farm — thank you SO MUCH for all your help! Small farmers need great WWOOFers like you to help them grow their farm and help you get the information you need to start your own. Safe travels, we look forward to hearing about your adventures and hope to see you both (and Maddie) at Lady Liberty Farm! We had such a great time with you guys at the farm! So many cool projects and wonderful beings! I saw that big mama had her piglets, Congrats!